This is actually a vinyl tablecloth with fleecy backing, turned wrong side out and stuck to the wall with drawing pins. But it works! And it’s much better than setting things out on the floor. These little blocks are my newest scrap project that I work on in-between other projects. Some are from the mixed lot of Fat Eighths I bought recently, and the rest are scraps from my other recent projects. This is my favourite block in the world to make! To make this block, cut 1 – 3.5 inch square for the centre. Cut 2 – 1.5 x 3.5 strips and 2 – 1.5 x 5.5 strips. Then assemble, first sewing the short strips on opposite sides, then the long strips on the remaining sides. They should finish at 5.5 inches unfinished, and 5 inches finished. This quilt is going to make someone very happy. Thanks for the tip to use a vinyl tablecloth as a planning wall! You chose perfect colors to brighten a teen’s day. It is such a fun quilt. What a great project. My design wall is some flannel fabric I had down in the bottom of a box for years. It has held up well and works. Isn’t it great the ideas you can use when you think about it. I like your blocks for a charity quilt. 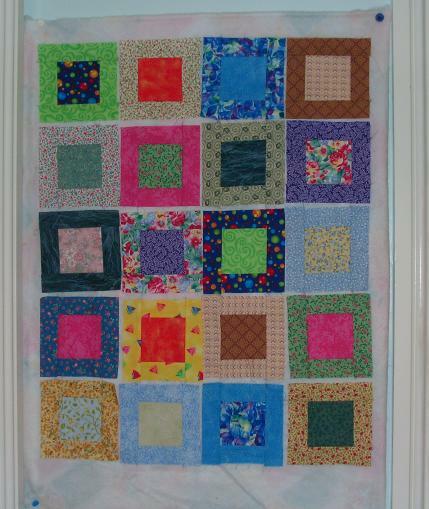 I’ve used similar blocks for charity quilts since they go together so easily & look so nice. you’re making “happy blocks”! Always fun to make! Lori, they are similar to Happy Blocks but are actually smaller versions of the blocks I used in my daughter’s birthday quilt (featured in the banner and in My Gallery).